So. It’s Friday and I still haven’t posted my menu plan for the week. This is because March is #crazypants and there IS no menu plan. I’ve been eating cereal for dinner. March is regularly the month where work becomes a little more insane than usual, and cooking/exercising/sleeping/being a nice person (sometimes, I do try to be one!) goes by the wayside. Planning, schmanning. And then yesterday, we had a glorious snow day, and I scrounged around in the pantry and came out with this heaping bowl of comfort – inspired by Cooking Light. In a large, deep skillet, heat olive oil over medium high heat. Add mushrooms, onion and thyme; cook down about 4-5 minutes. Add garlic and cook an additional 3-4 minutes. Add white wine and vinegar, cook down a few minutes. Add broth and season with salt and pepper. Add chickpeas, bring the whole thing to a boil, reduce heat and simmer. For the polenta, bring your water to a roiling boil. 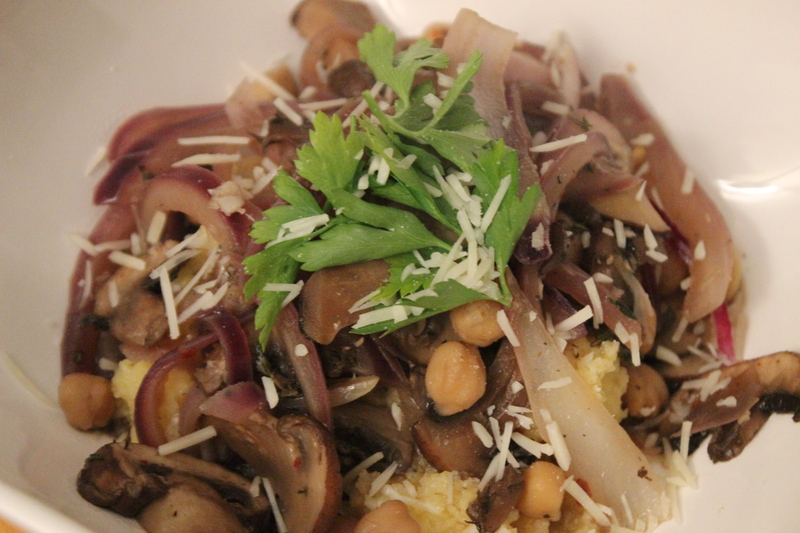 Add the polenta slowly – whisk swiftly so it doesn’t clump! Remove from heat after it thickens and add your cheese. I added the blue cheese cream from the steaks we had for Valentine’s Day as well as a hefty about of parmesan. Season with salt and pepper. 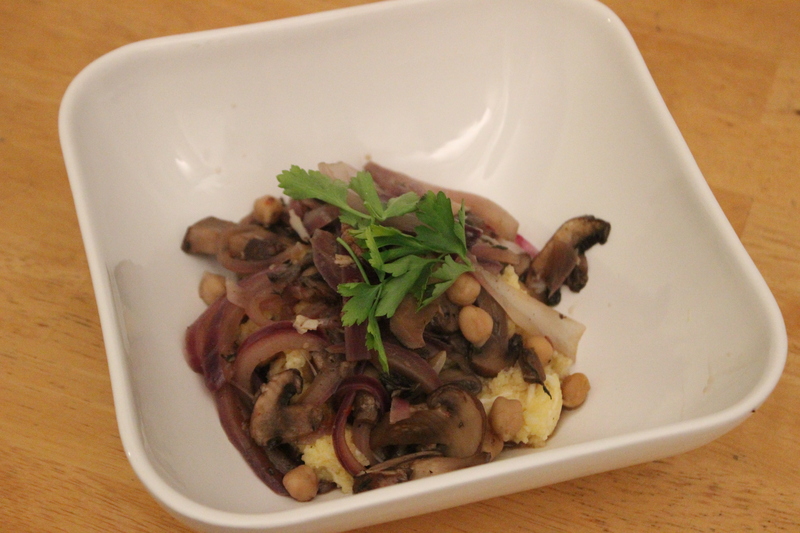 Place the polenta at the bottom of a bowl, top with the mushroom mixture, a little bit of parmesan and the parsley. This is basically just comfort food in one bowl. March: bring it on.